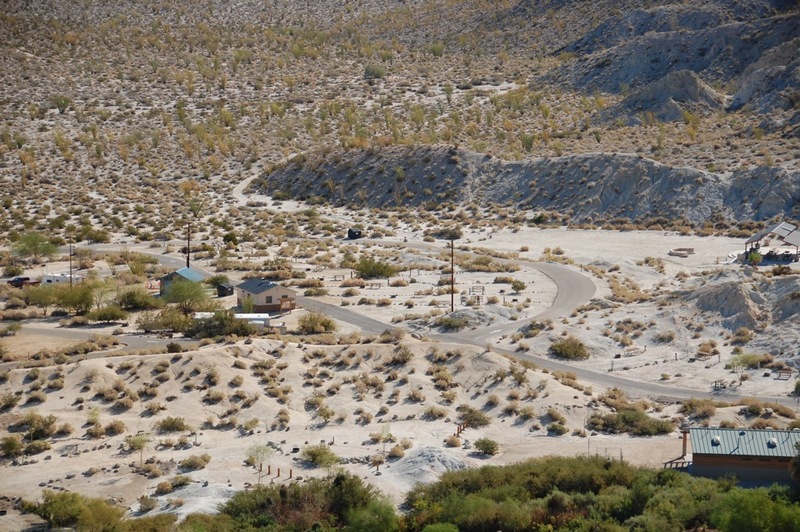 It was love at first sight when we arrived at Agua Caliente County Park for the first time in November 2010. We were thrilled that this park now allowed dogs and we scouted out the best site for our style of camping away from crowds. We didn’t mind that the sites did not have Wi-Fi or cell phone reception without using special antennas or boosters. 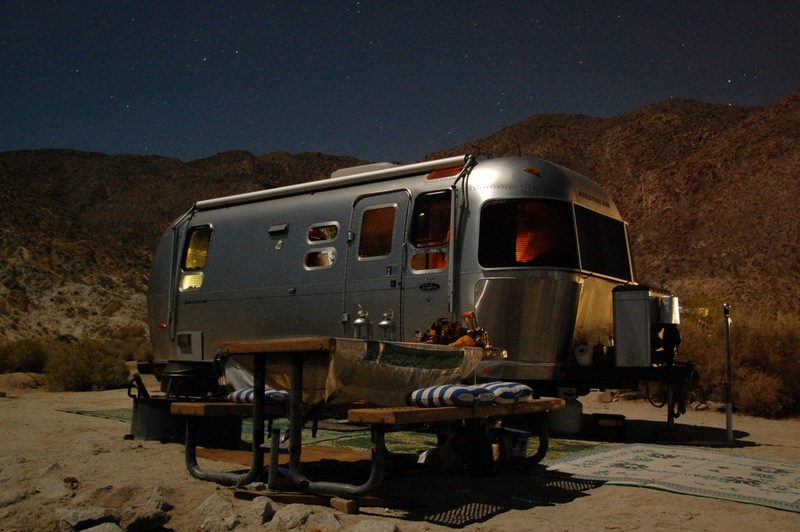 This site was just big enough for our trailer and was nestled near mountains and had gorgeous vista views. 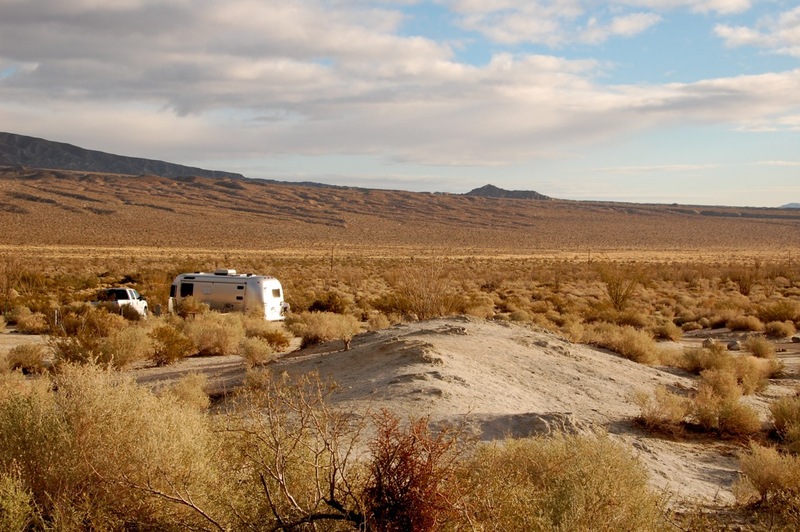 This quickly became our favorite desert camping site, so you can imagine our shock last fall to learn that we could not reserve this site or any of the other eleven RV sites on this southeast loop of the park because cabins were about to be built there! 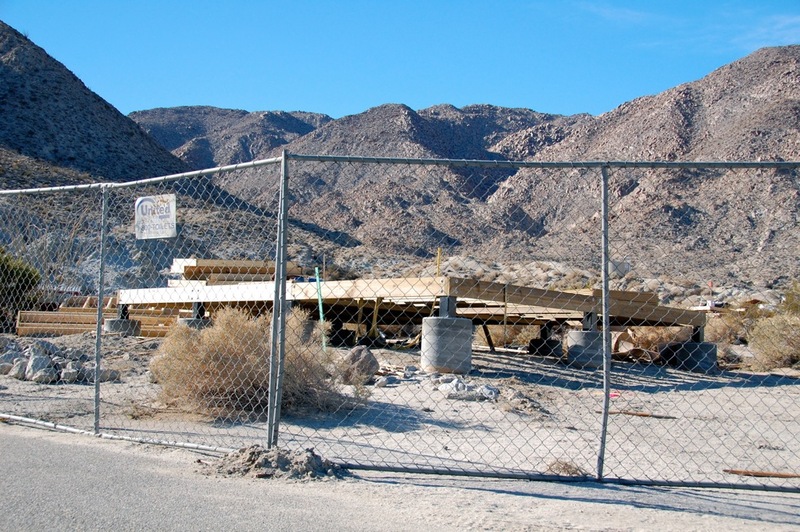 By January, the foundations were in place for seven Agua Caliente cabins that the Annual Parks Improvement Plan estimated will cost $500,000. Although this initially shocked me, I can understand and sympathize with the dilemma many camping parks are experiencing. Economic hard times over the past few years have undoubtedly caused some people to camp less, and stay closer to home, while parks and campgrounds have experienced increased costs and decreased funding, which have resulted in cutbacks in staffing and services. 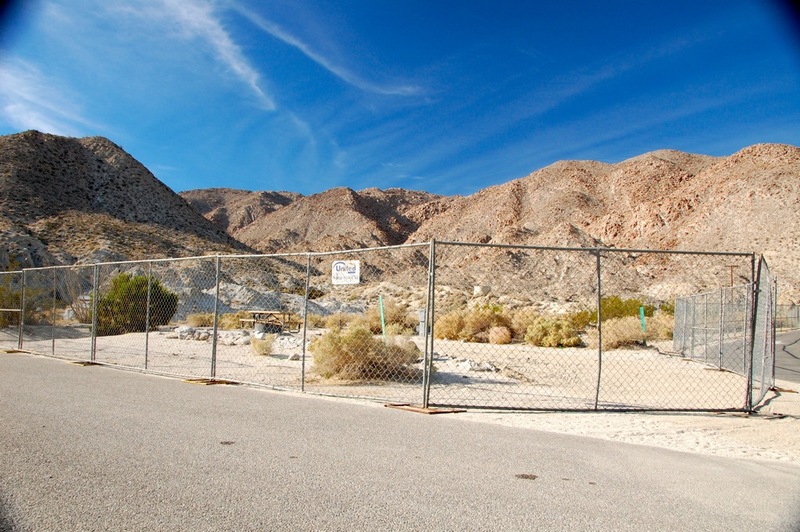 Additionally, “Today’s [sequester] Cuts Mean Wide-Ranging Impacts for Parks – and – People around the Country”, writes Tom Kiernan, President of the National Parks Conservation Association, and detailed in the National Parks Conservation Association’s Park Advocate posting of March 1, 2013. “Funding Discussion Shares Creative Solutions for National Park Funding Woes”, writes Tom in an article for the Huffington Post Green Blog, 3/20/2013. One solution for some camping parks is to provide cabins to attract new campers who are not ready to invest in camping gear or an RV. “California State Parks have endured hard times and budget cuts for a number of years now… Our proposal to revitalize and reopen Tamarisk Grove Campground was selected by California State Parks for a special grant last March… 10 new cabins will be built onsite to give folks an alternative to tent or trailer camping”, writes Kathy Dice, Anza-Borrego Desert State Park Superintendent, in her “Superintendent’s Corner” of the Anza-Borrego Foundation‘s Desert Update, Fall 2012 issue. 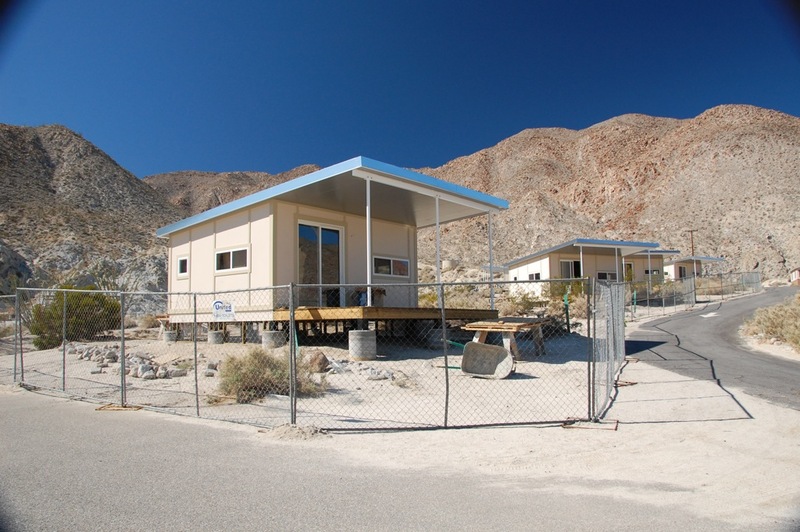 As the Agua Caliente cabins are nearing completion, I still have mixed emotions about cabins replacing RV sites. Cabins are structures that permanently occupy space and block views, especially noticeable in this vast desert setting. * New cabins in wooded settings, such as William Heise County Park*, seem to tie in better with the surroundings and are less obtrusive. 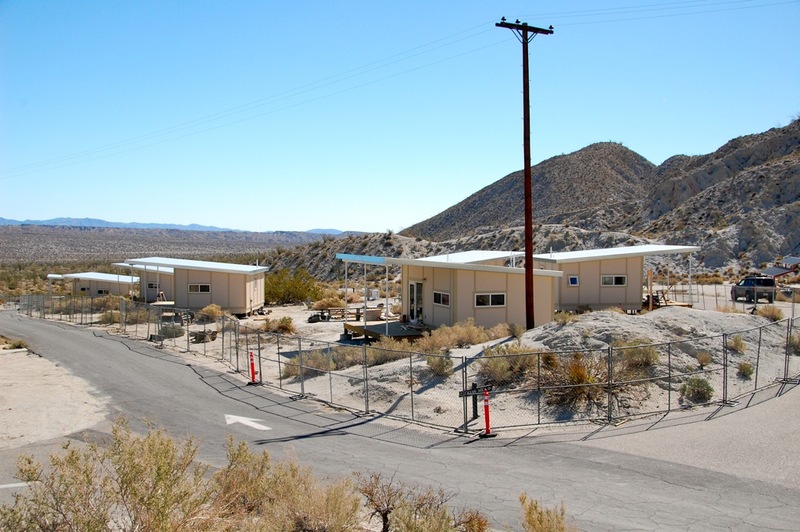 Agua Caliente Campground is also currently upgrading its electrical service to include 50 amp power and eliminate the power poles, and plans to upgrade the sewer system. 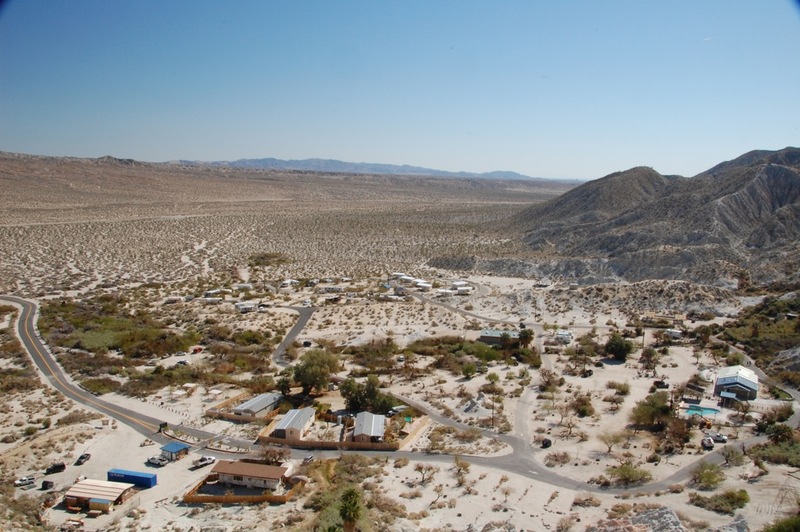 The plan also calls for new RV sites… eventually. But as the documentary Surviving Progress* points out, we must make a distinction between good progress and bad progress. Our celebrations of life continued last week as we took our Airstream Safari and Airstream Life, Spring 2013 issue, and our dogs, Mac and Tasha, out to Agua Caliente County Park in the Anza-Borrego Desert for five days of camping under a glorious sun while celebrating my birthday and the imminent arrival of St. Pat’s Day and Spring! 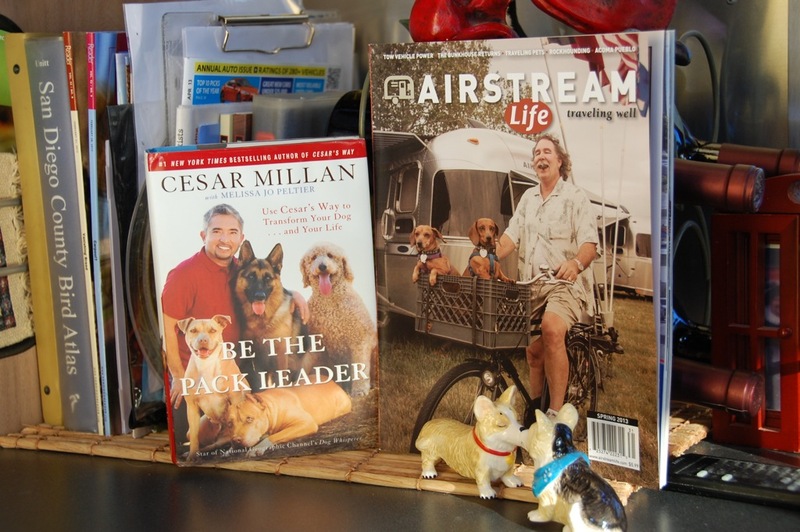 This issue of Airstream Life features an article, “Airstreaming With Pets”, which lists considerations when traveling and camping with pets. 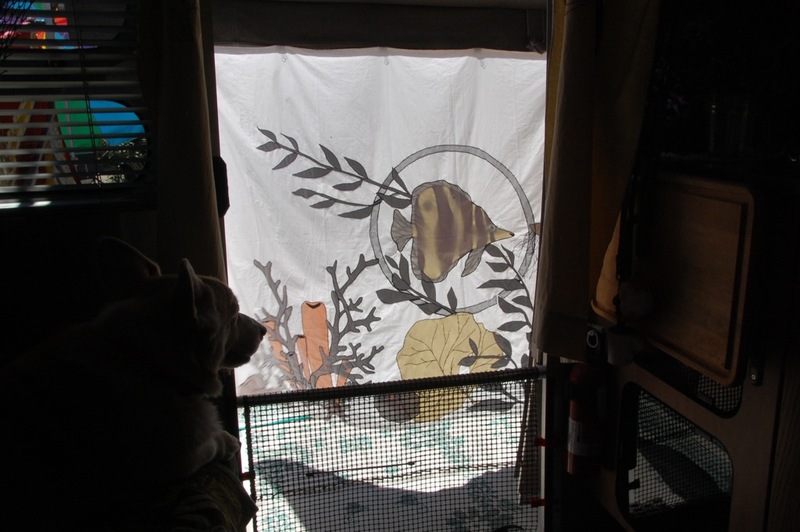 Our dogs have always joined us over the past six years of camping trips with the Airstream and I have posted the article, “Traveling and Pet Safety“. 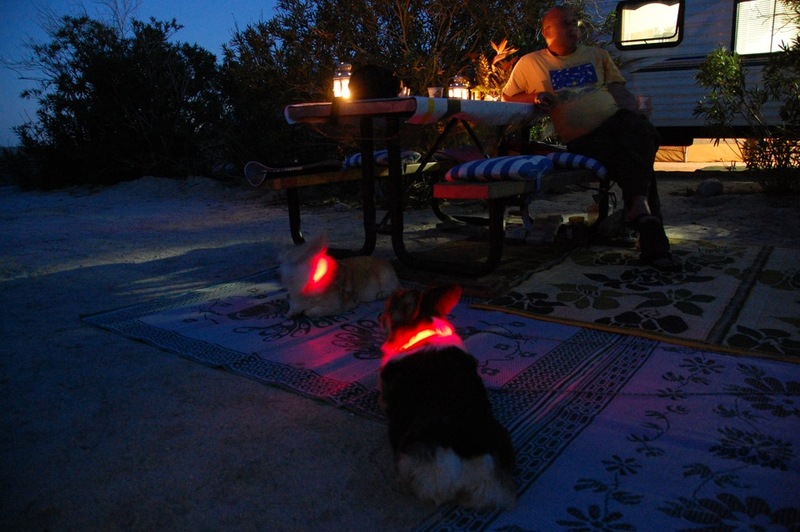 The Corgis always travel in a crate strapped on the folded down back seat of the F-250, and wear a Nite Dawg LED illuminated dog collar with a flashing feature by Nite Ize for safety and visibility at night around the campsite and while taking nighttime walks. 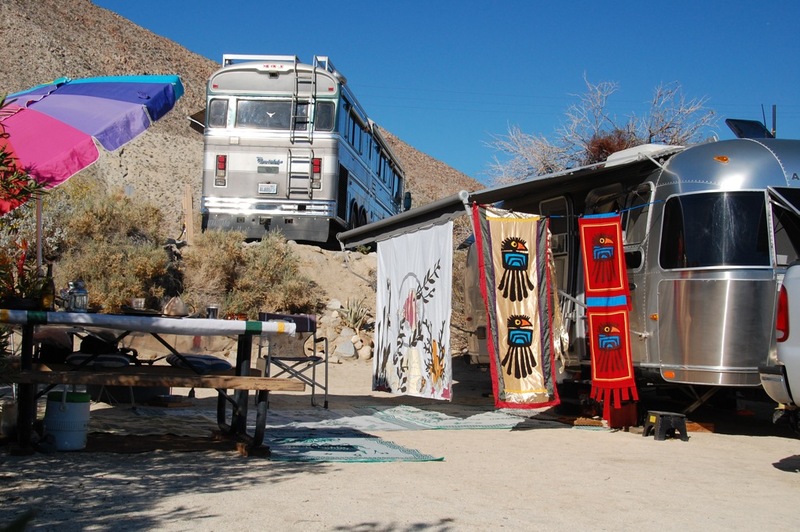 Our campsite was illuminated each day by a bright sun and Larry’s sun screen sheet and toucan decorative banners provided shade, privacy and a festive display. The softer seascape images on the back of the sun screen gently undulate in the breeze providing shade and privacy. I again hiked the 2.5 mile loop of the Moonlight Canyon Trail, where I photographed bighorn sheep last November, but no sheep were visible and the spring flower display was meager due to scant rainfall this winter. But I did find Chuparosa, Justicia californica, in bloom near the saddle of the trail. 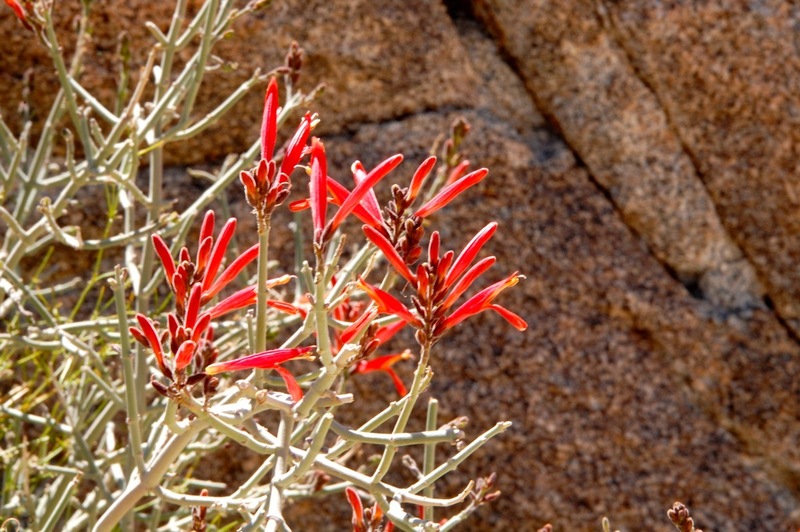 Although the spring wildflowers were lacking, the desert presented an abundant display of subtle colors and textures of rocks and plants such as the ocotillo, agave, and cholla, which I appreciated as I climbed up the Desert Overlook Trail and enjoyed the vista views. The trail climaxes on a ridge with a wonderful view of the whole park. 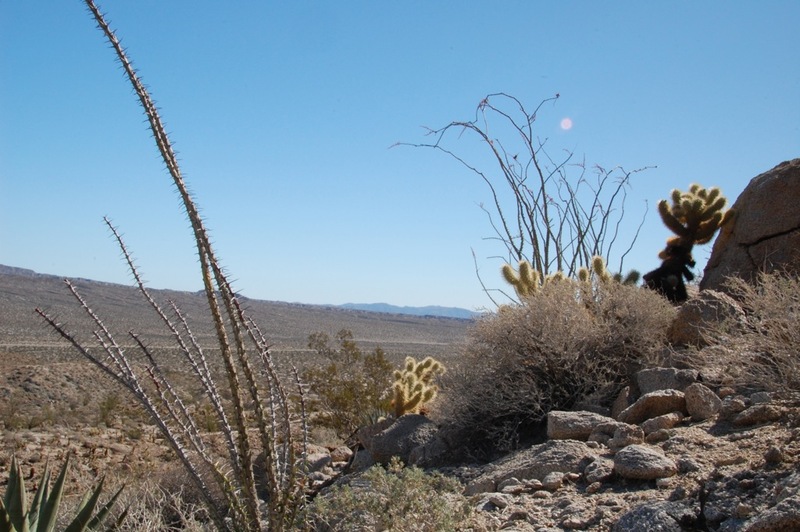 Agua Caliente Regional Park* of San Diego County is a 910-acre park next to the Tierra Blanca Mountains and features pools and a therapeutic indoor spa, trails, and spectacular views. This park, along with many others across the country, is undergoing major changes, and I will shed light on some of these changes in my next post.